An AIR SHOW, (also airshow, Air Fair, or Air Tattoo) is a public event at which aviators display their flying skills and the capabilities of their aircraft to spectators, usually by means of aerobatics. Air shows without aerobatic displays, having only aircraft displayed parked on the ground, are called "static air shows". List of air shows - Wikipedia. ALBERTA INTERNATIONAL AIRSHOW - hosted by Lethbridge County Airport. Lethbridge, Alberta, Canada. BAHRAIN INTERNATIONAL AIRSHOW - in association with Farnborough International. Bournemouth Air Festival - since 2008. Europe's largest free annual airshow held on the Bournemouth seafront. It takes place over the course of four days each August and attracted around 1,300,000 spectators last year. DUBAI AIRSHOW - biennial show since 1989. International Aerospace exhibition. The fastest growing air show in the world's fastest growing region. FARNBOROUGH INTERNATIONAL AIRSHOW - one of the world's most iconic global aviation events held biennially in Hampshire, England. Week-long event that combines a major trade exhibition for the aerospace and defence industries with a public airshow. The event is held in mid-July in even-numbered years at Farnborough Airport in Hampshire, England. The first five days (Monday to Friday) are dedicated exclusively to trade, with the final two days open to the public. ILA Berlin Air Show - since 1909. 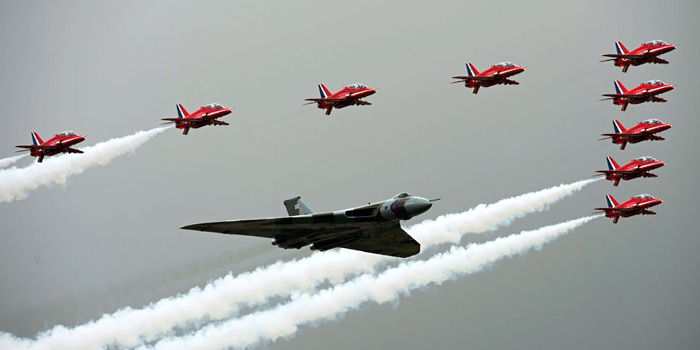 Combines a major trade exhibition for the aerospace and defence industries with a public airshow. It is held every even year at the new Berlin ExpoCenter Airport near Schönefeld, Brandenburg 18 km southeast of Berlin, Germany. International Airshow Air14 Payenne - took place at Payerne AFB military airfield of the Swiss Air Force north of Payerne in Switzerland, located approximately halfway between Lausanne and Bern, on August 30 to September 7, 2014. MAKS - since 1992. "International Aviation and Space Show") is an International Air Show held near Moscow, Russia on Zhukovskiy LII air field. MAKS is an important event in Russian business. Although it started mainly as an entertainment event, the show soon became a marketplace where Russian airplane manufacturers could find export contracts and Russian air carriers could find foreign contacts. The whole event became important through CIS and neighboring countries, due to similarities of the market. PARIS AIR SHOW - Salon international de l'aéronautique et de l'espace, Paris-Le Bourget. Established in 1909. The world's oldest and largest air show. Since 1953 held every odd year at Le Bourget Airport in north Paris, France. Royal International Air Tattoo - the world's largest military air show, held annually over the third weekend in July, usually at RAF Fairford in Gloucestershire, England in support of The Royal Air Force Charitable Trust. The show typically attracts a total of 150,000 to 160,000 spectators over the weekend. SINGAPORE AIRSHOW - "Asia's Largest Aerospace & Defence Event."